Most people will be familiar with the Wills Wing T2C but perhaps not with the latest developments. My Technora 0DL0 with window lower surface T2C arrived just after Xmas and I’ve had a great time flying it. I’ve done hundreds of hours on T2s and my last hydranet T2 handled and performed very well after much tuning. I've flown lots of T2Cs but this latest version really has me impressed. It looks tech with the airfoiled carbon keel stinger, black uprights, see-through sail and the pointy raked tips but the best improvement is in the way it performs. This model has a markedly better glide and better glide at speed, in addition, flare authority is now better than most intermediate wings. There’s still speed and landing space to deal with but flare timing is super easy, even in zero or crosswinds that I’ve had. The 0DL04 Technora main sail is lighter than previous versions and this glider has a Technora ‘window’ lower surface as well. It is seriously flat and free of wrinkles. One pair of lower battens is now gone, which may help with handling and landing. The tinted transparent sail helps a little when setting up as you can see if the sprogs are lined up. 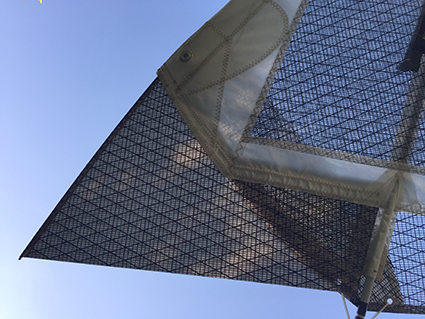 Mylar sails were previously impractical for long term use but this custom material is surprisingly tough, with superb longevity and added UV protection built in. It is however, less visible in the air, in fact if you get Technora leading edge panels, it’s a likely candidate for a midair so most opt for a white leading edge panel. 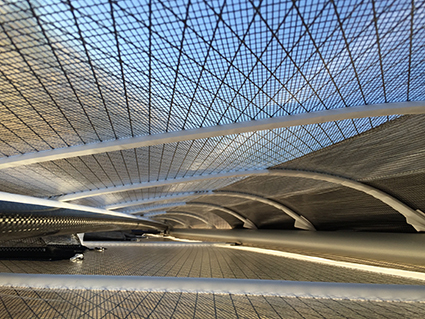 The Speed Battens are 8 flat carbon rods about 8” long that are internally sprung on the trailing edge. I expect they provide support while allowing a more flexible tip area. They are small and easily forgotten in a jacket pocket so watch you don’t lose them. The Raked Tips on my glider are larger than standard. They are essentially Technora and foam triangles supported by thin carbon rods inserted beside the tip wands and attached with velcro. They are said to reduce tip vortices but the most noticeable effect is keeping the glider from winding in when turning with VG on, allowing a steeper bank angle and allowing you to slow down more. When landing the glider appears to go longer in ground effect and requires a later flare. They seem to keep the tips flying longer and help keep the glider from dropping a tip. My larger tips slow the roll rate slightly but there is no effect on yaw. I leave them off when rigging in strong wind or flying in punchy conditions. Gliders I've flown with the standard raked tips seem to roll like a standard T2C. I did a little fine tuning which went exactly as the manual advised using the tip adjusters; It’s easy when everything is made so perfectly symmetric. Then I went xc flying at Omarama. I’d had 6 months of no flying due to work injuries but I’ve never flown so well; clocking up several long (for NZ) flights straight away and a higher XC Champs total in the following month than I’ve ever had. Then due to other commitments, no flying for another month but I then won the Omarama XC Classic. I put this down to the handling and climb being as good as my last T2 but the glide and speed improvement giving me more range. Very handy when flying into wind and crossing sink areas. 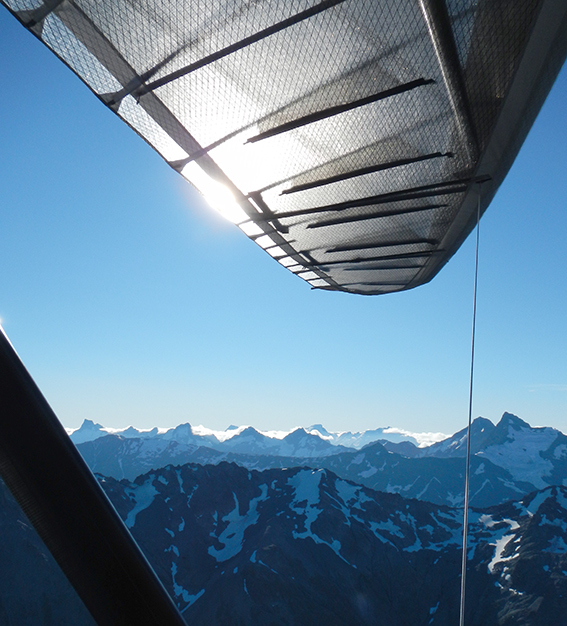 I’ve never been over 10,000ft so often either but that could be due to better weather this year. I think the tighter sail makes it feel more of the turbulence, but when diving away from cloud at speed, the glider goes on rails; keeping stable and straight without the slightest tendency to oscillate. It’s truly turbulence tested now in seriously violent climbs in leeside thermals as well as a load test when it was attacked by a strong dust devil, with one wing up in the air and 2 tiedown warratahs pulled half out of the rocky ground as we held it down, leaving no damage. I’m confident it’s as safe and strong as any glider can be. In coastal conditions, the speed and glide has been most useful, getting to hard to reach places really well. Handling is as good as you could ask for in a comp/xc wing. UPDATE 2019; This years Omarama XC Classic had more stable scratchy days than usual, so I had the raked tips on almost every day. The glider finished in first place and also took longest flight.